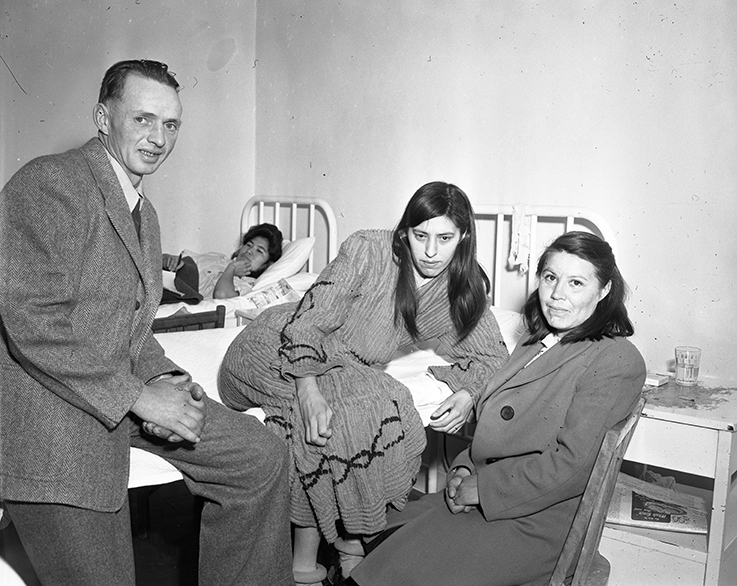 The hospital shifted from that of a Tuberculosis hospital to that of an “experimental” one run by the United Church and the Department of Indian Affairs. 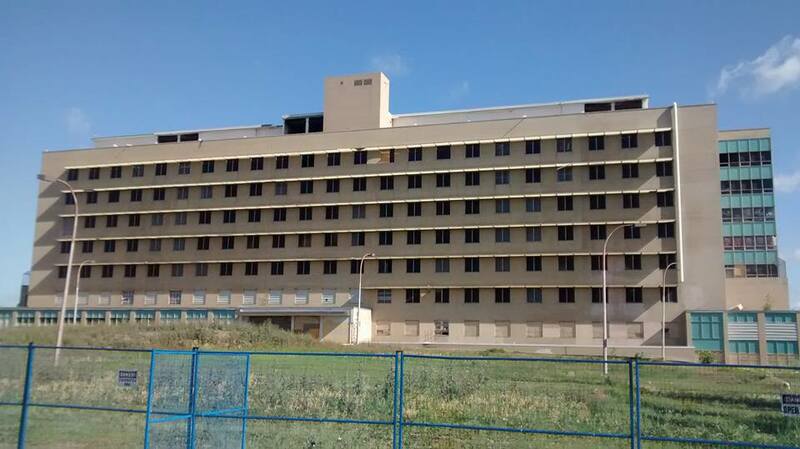 We can only imagine the horrors that took place behind the walls of the Charles Camsell. There are reports of abuse and murder taking place here, and a denied rumour says that there is a mass grave of aboriginal children located on the south side of the building, in what used to be the staff garden. There are factual inconsistencies in this paragraph, and no evidence here beyond links to similarly vague statements. But that doesn’t mean it has no meaning. 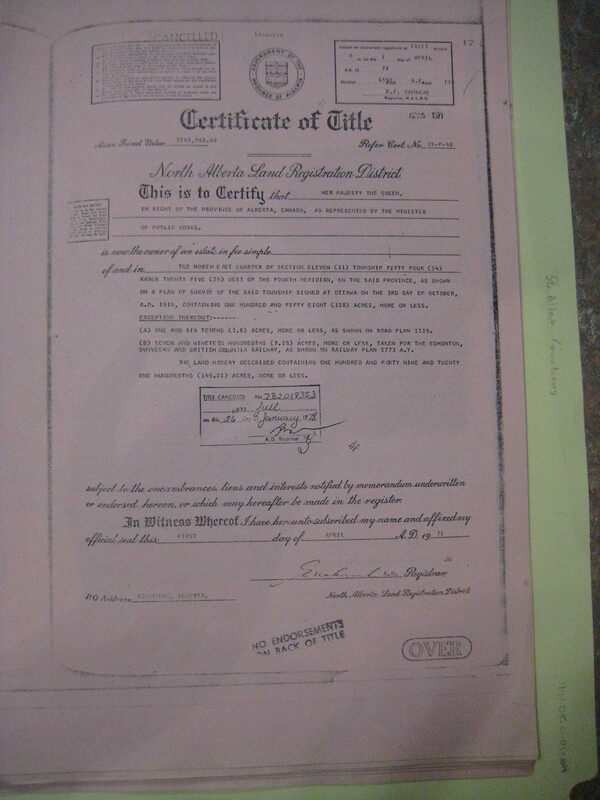 So much documentation and memories have surfaced during the Truth and Reconciliation Commission around Residential Schools in this country, and recent books like James Daschuk’s Clearing the Plains, Candace Savage’s A Geography of Blood, and Mark Abley’s Conversations with a Dead Man: The Legacy of Duncan Campbell Scott, have pushed conversations around colonialism into public consciousness. I read recently that when allegations of abuse first surfaced around the residential schools, some people disbelieved them simply because they were so horrific. “One of the things that’s happened almost every time I’ve talked to a survivor or an elder is suggestions of more experiments,” he said. Mosby has been following up on letters he’s received from residential school survivors since his article came out, including one in August from an anonymous writer who talked about communities where dentists may have been literally pulling teeth for research purposes…. I am committed to looking seriously into all the rumours and stories and memories. When I am told by Miranda Jimmy that not all the kids lost at the Camsell were because of illness or death, but were “sometimes adopted out to families [in the city]”, I will take it to heart. I will also do all I can to help connect people with information about their loved ones. 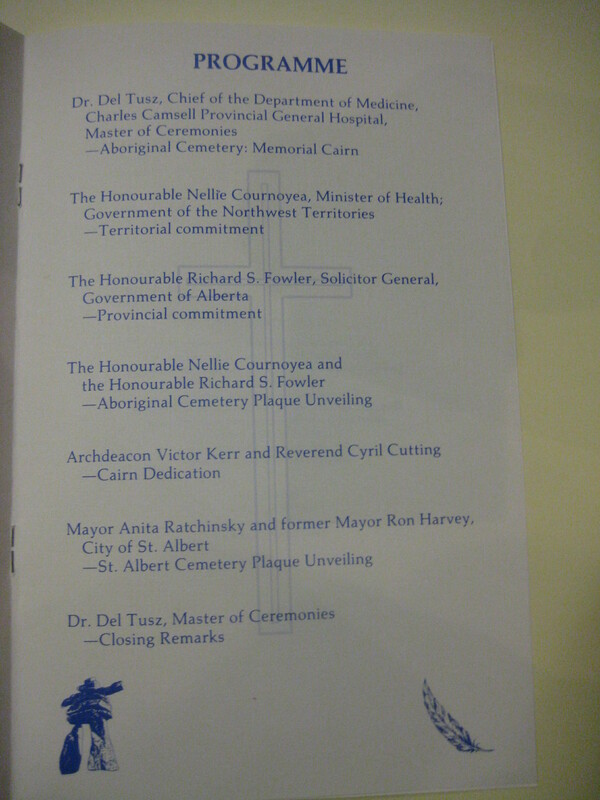 There are still those ten blank spaces on the St. Albert Aboriginal Cemetery list to figure out. I hope it turns out that they were people whose families were able to take them home, as Sheila Willis suggested on Facebook. 1. If the Aboriginal Cemetery in St. Albert was where Anglican or United Church patients who died at the Camsell were buried, where were the Catholics brought? 2. Are there indigenous patients from the Camsell buried at Beechmont or Winterburn Cemeteries in Edmonton? Or the “Aboriginal burial ground on the south side of the Whitemud [highway]” that one person alluded to? I saw in a 1975 internal memo for Albert Public Works there was a request to have a Jack Ehagitatok interred in St. Albert but he was buried elsewhere in Edmonton as the Aboriginal Cemetery was not registered with Health Inspection Services Branch of Alberta Health & Social Development. Where was he laid to rest? 3. 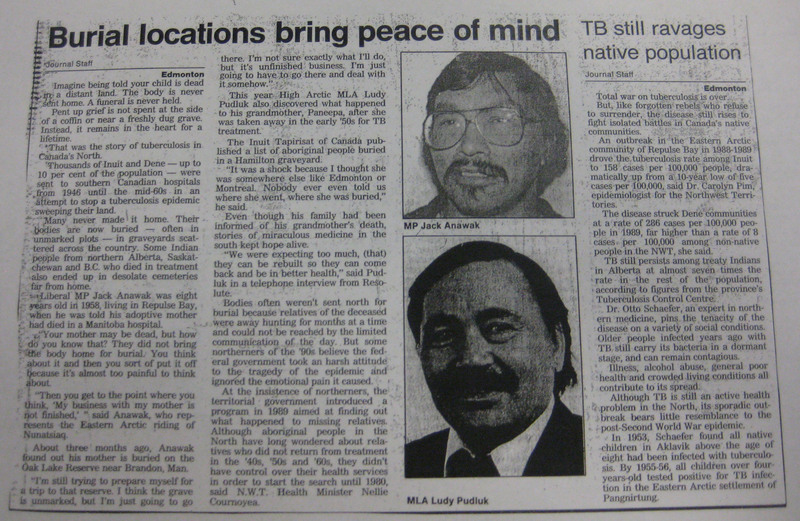 How many are like High Arctic MLA Ludy Pudluk who only found out in 1990, decades after his grandmother left for treatment, that she was buried in Hamilton, near the Mountain Sanatorium. “It was a shock because I thought she was somewhere else like Edmonton or Montreal. Nobody ever even told us where she went, where she was buried,” he told journalist Erin Ellis. How many people are still missing? How many people are still looking for answers about loved ones who left and never returned? I accept and embrace the fact that the Camsell – and these questions – will haunt me while I write grant applications and wait for results, and hopefully get the opportunity to keep chasing these elusive ghosts and filling these blank spaces. June 22, 1990 was a sunny, hot and dusty day out at the Aboriginal Cemetery. A prairie wind whipped decorations and papers as government and church and hospital representatives got ready to dedicate the cairn. The crowd of about seventy-five people had just been bused in to the cemetery grounds from the seniors centre in St. Albert, where a luncheon was put on. The sound of a bagpipe started up and cut through the rustle of leaves and murmur of voices. Behind Don McLeod, the piper, Cst. Myra Thiemann and Cpl. Ken Munro marched in full RCMP red serge. Behind them walked the dignitaries slotted to speak on the stage decorated with planters donated by local luminaries Lois and Ted Hole. 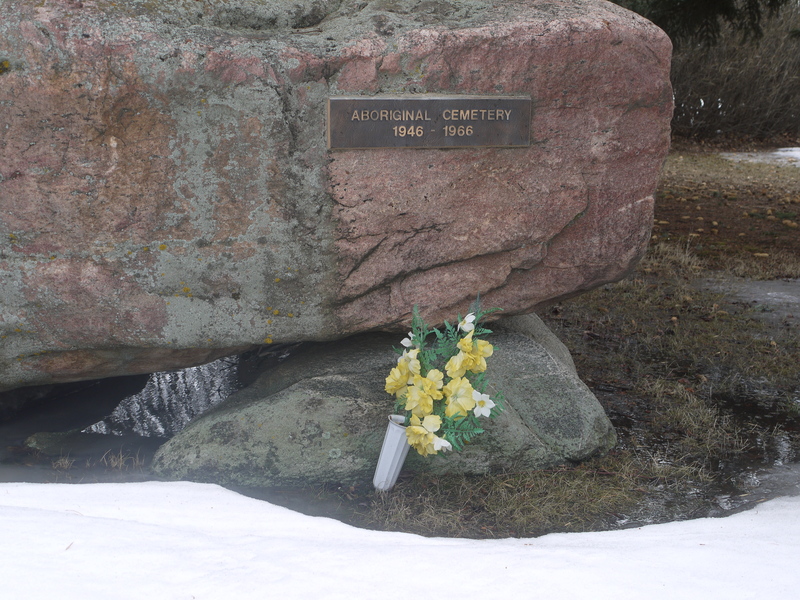 The City of St. Albert in 1990 said it would send copies of the programme and photograph of the cairn to any family members who contacted them about loved ones buried there. The Mounties took their place beside the cairn, standing at honour for the half hour programme emceed by Dr. Del Tusz, Chief of the Department of Medicine from Camsell Provincial Hospital. Then there were a few words by Richard S. Fowler, Solicitor General for the Government of Alberta and former Mayor of St. Albert). Mayor Anita Ratchinsky and former Mayor Ron Harvey of the City of St. Albert also spoke, and Archdeacon Victor Kerr and Reverend Cyril Cutting both said prayers on behalf of the Anglican and United Churches. The most moving of the speeches, I found, was Nellie Cournoyea’s. 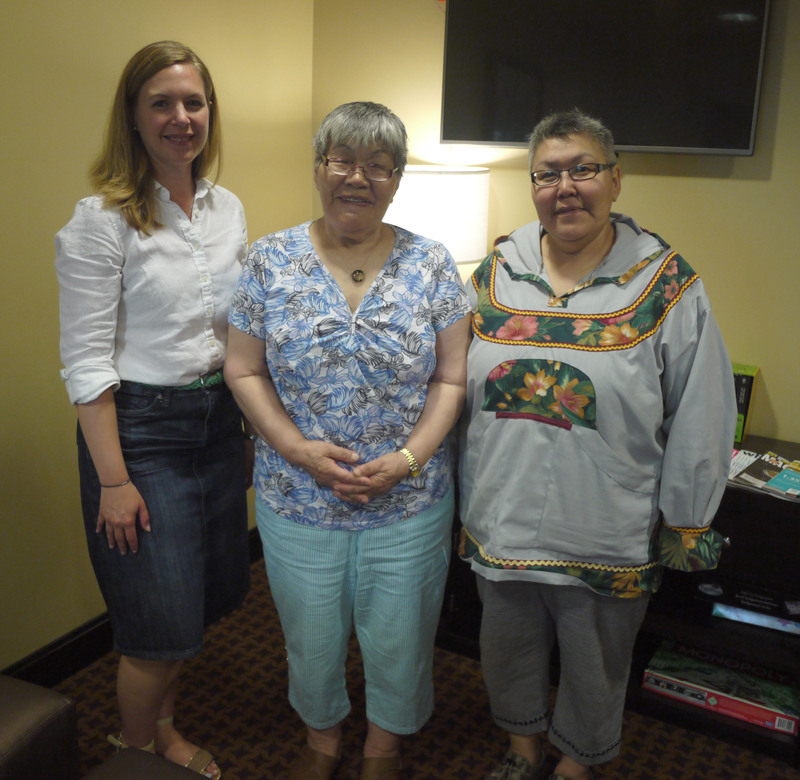 She was Minister of Health for the NWT Government. Like quite a few of the people I’ve met from the Western Arctic, her mother was Inuvialuit and her father was Scandinavian — a Norwegian trapper. 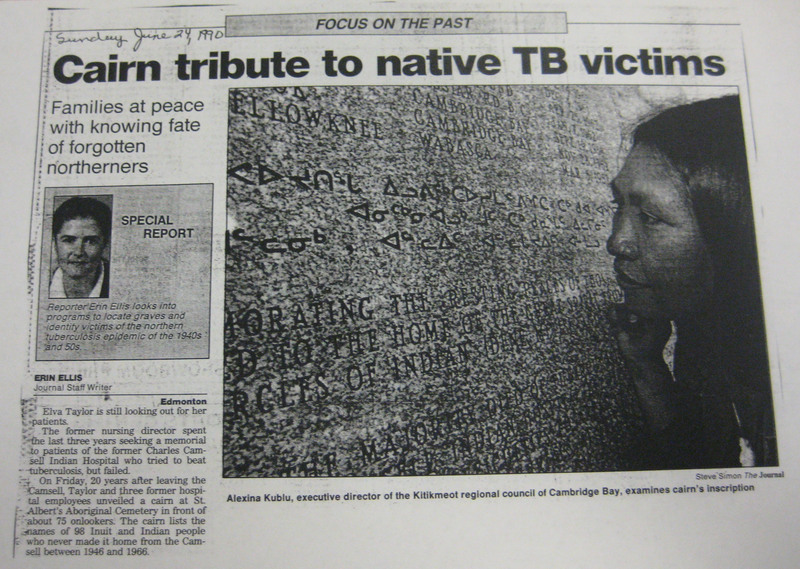 Among the crowd was Alexina Kublu, executive director of the Kitikmeot Regional Council of Cambridge Bay; her family was still searching for a great-grandfather who died of TB in a southern hospital. Looking at the choppy video footage of the event at the St. Albert Heritage Museum archives, I analyzed the program and scanned the crowd, looking for other signs of indigenous involvement. There were precious few. The archival records told me why. In the two years it took the monument organizing committee – made up of Elva Taylor, Dr. Otto Schaefer, and Maxine LeClair of the Camsell, and Don McBride of the Edmonton Residential School – to raise funds and plan the cairn, it tried to reach out to local indigenous groups without luck. In fact, as far back as 1979, new City Clerk Fiona Daniel had sent letters to various indigenous organizations to ask questions about the cemetery, the plaque and the cairn without much response. They’re all good theories. After all, it was in the 1980s and 1990s that stories of residential school abuses and inter-generational trauma really started surfacing. That would certainly have kept organizations busy. Finally, what kind of legacy did the Camsell have with indigenous people? Former Nursing Director and monument committee chair Elva Taylor told a journalist, “We were like one big family at the Charles Camsell.” Did patients feel the same way about the Camsell? Many people have asked me why it was so hard to figure out who was buried there, and why to this day you can’t see where each body was laid to rest. Usually, it’s because they want to know why they can’t visit the exact spot their loved one is. Like much of the history of native-newcomer relations author Thomas King and others have outlined, it’s basically a story of land and jurisdiction. That happened in the 1970s, but by the time the “Old Indian Cemetery” hit administrators’ radars, it was overrun by weeds and waist-high grass. This was an understatement. The wooden crosses, which were painted white, had been rendered illegible save two: “Owen Joe – son of Chief Joe – 18 years – 1949” and “Kidlak – July 1916 – October 1965”. The crosses weren’t even in place anymore by the 1980s but were stacked in a pile on one corner. To restore the cemetery, John Beedle, Parks Planner for the City of St. Albert, received a small grant and did a lot of work. According to an internal report prepared in 2000, the land was uneven with “sunken graves and piles of clay”, and when equipment was brought in to level the land, it “revealed the outlines of the disturbed soil of each grave.” John was able to produce a rough drawing of the configuration of graves based on this, and Don McBride, former Camsell administrator, redrew the lost cemetery plot plan from memory. John Beedle – and the others interested in the Aboriginal cemetery’s restoration – wanted it to be a beautiful, park-like setting, so they trucked in topsoil and grass seed along with mature trees. 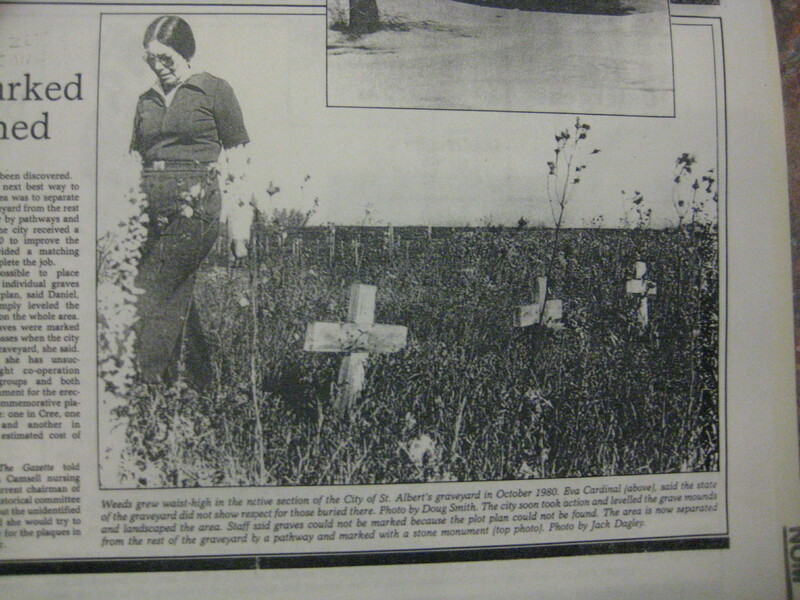 According to records at the St. Albert Heritage Museum, the City checked with both the Dene and Inuit Cultural Institutes on the wording “Aboriginal Cemetery”. The boulder had been found at the side of a road about twenty kilometers from St. Albert near Lac La Nonne. But Dr. Otto Schaefer, a doctor who worked extensively in the North, said it didn’t seem local, so he sent photos and samples to a professor of Glaciology at the University of Alberta, Dr. Norman Catto. It turned out the boulder was two and a half billion years old and originally from Great Slave Lake in the Northwest Territories. It had been transported uphill on a glacier and deposited near St. Albert when the glacier receded. A northern boulder standing guard over a graveyard of mostly northern people. There was some poetry in that. But maybe the boulder and plaque weren’t enough. In a newspaper interview around this time, Ray E. Harris of the Gitxsan Nation in B.C., who had been a student at the Edmonton Residential School, wanted to see a memorial put on the school site next door to the cemetery. “When you don’t do that, their spirits wander.” Maybe the Aboriginal Cemetery needed a proper memorial with all the names of the dead too. When I began researching this project, I struggled with which photos to post, which names to share. I didn’t want to re-traumatize anyone or be voyeuristic or trespass on someone’s experience. But in the past few days, northerners have been sending me messages asking if their loved one’s name is on the cairn. Even the Elders at the Kitikmeot Heritage Society in Cambridge Bay, Nunavut are apparently reading along and wanted to ask about some names. 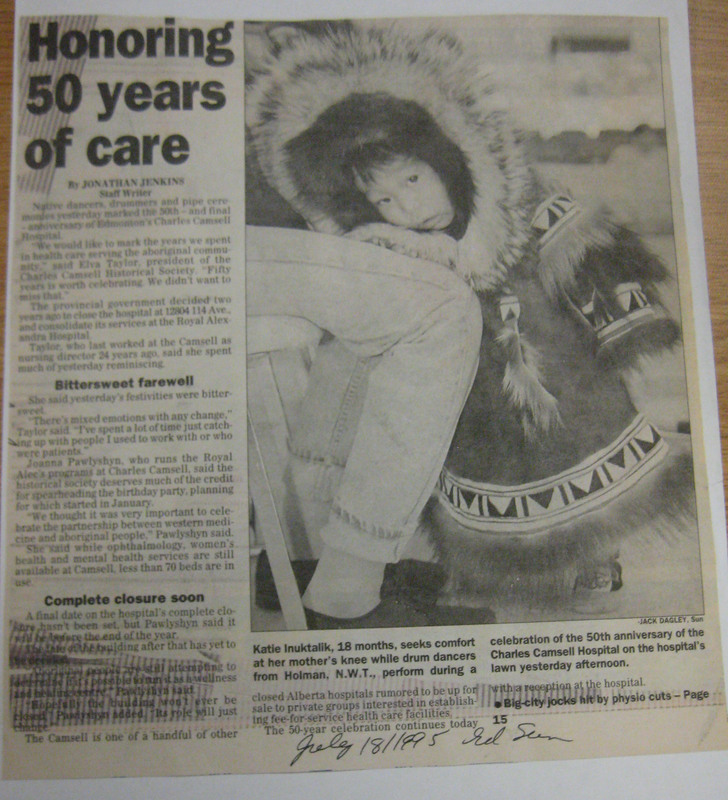 I also noticed in my research that magazines like Inuktitut published in 1990 the names of Inuit buried in Woodland Cemetery in Hamilton, Ontario (Mountain Sanatorium used to operate there. 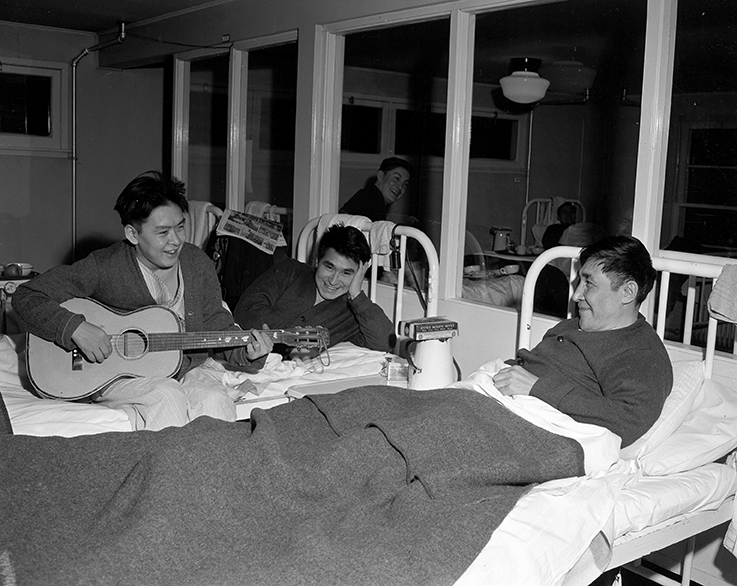 According to this site, between 1958 and 1962, 1272 Inuit were treated there for tuberculosis). So I will share this list with all of you, and hope that it helps to solve some mysteries and possibly, in the words of one woman who contacted me, provide closure. The list in the archives was divided by the quadrant in the cemetery (or face of the cairn) but I have alphabetized them by first name. Hopefully this makes it easier to find your loved one. If you have any information to correct or add (spellings could be quite creative), please get in touch. If you would like to share any stories or photos about these people, I would be honoured to receive them. As we saw in yesterday’s post about Winnie Lyall and her mother, Nipisha, each name on the cairn connects with real, live people and family members – often in distant locations. Sometimes, as in the case of Nipisha Lyall (of Taloyoak, NWT) and Peter Kamingoak of Coppermine, NWT, they knew which southern city their loved ones had been buried in. 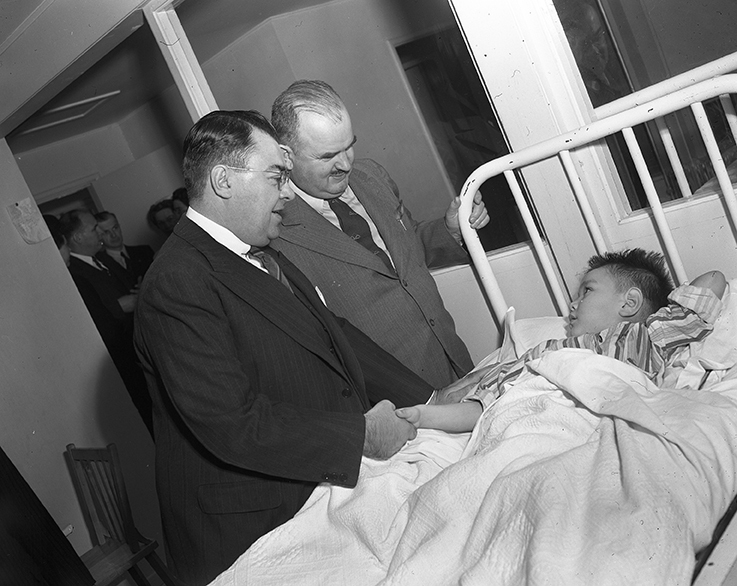 Kamingoak’s young son and wife were both at the Camsell in 1950 being treated for TB. When his son, William (Kamincook on the cairn – spellings could be creative) died at 16 months, his mother was too sick to go to his funeral. Betsy Blackjack’s name is also on the cairn. Her family in Carmacks, Yukon never forgot her, but they weren’t sure where she had been buried. Her great-grandson, George Evans contacted various people looking for info about her in 1984 on behalf of her son, Clyte Blackjack. His query ended up on the desk of St. Albert City Clerk Fiona Daniel. Fiona had stepped into the position in 1979 and replied to him in a letter. She wrote to him of her five-year search for information about who was buried in the Aboriginal Cemetery, and she encouraged him to pursue it politically as they had exhausted all bureaucratic roads, as she put it. 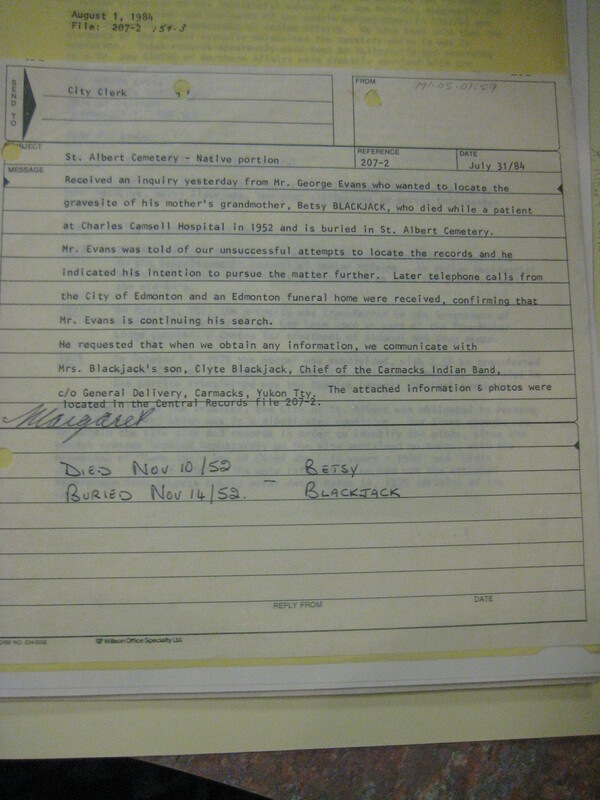 Once the list came to light, Fiona wrote the Blackjack family again and told them she had discovered Betsy had died November 10, 1952 and was indeed buried in the cemetery in St. Albert. I learned that by the 1980s there was increasing pressure by indigenous northerners to find out what had happened to the loved ones sent south between the 1940s and 1960s and who never returned. It wasn’t until 1989, though, that the territorial government in the NWT instituted a program to finding missing relatives – and graves – in southern Canada. Even now there are still indigenous people who died in Indian Hospitals or Indian Residential Schools whose final journeys and resting places are undocumented. A couple of blog posts ago, I mentioned that I had found ten blank spaces in the archival list of those buried in the Aboriginal Cemetery. One reader had what would have normally been an excellent suggestion for tracking them down: check the death records in St. Albert. Fiona Daniel tried this. She chased down leads locally, in the NWT and Ottawa. First she looked for a plot plan and cemetery records in 1979. She tried the United Church, which had run the Edmonton Residential School where the cemetery was located. Someone suggested the information might have gotten bundled in with the Residential School records and sent to National Archives in Ottawa, so she tried there too. Former St. Albert Gazette reporter Erin Ellis today. 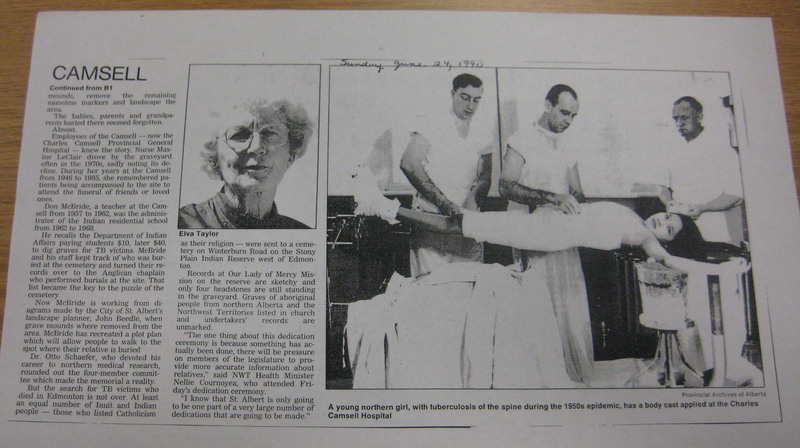 She was completely unsuccessful until 1987 when she was tipped off by St. Albert Gazette reporter Erin Ellis that former Camsell nursing director Elva Taylor had tracked the list down. It had been in the possession of Beatrice Clough, the widow Archdeacon C. F. A. Clough, the Chaplain of the Charles Camsell from 1946 to 1968. Elva had led the Charles Camsell Historical Society which had put out a book in 1985. 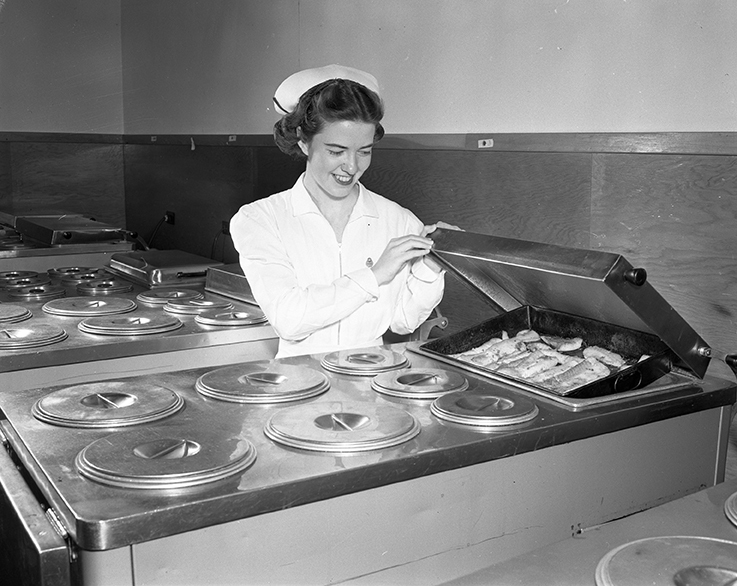 The list was now in the Camsell fonds at the Provincial Archives of Alberta. Apparently this could also be the case at Indian Hospitals in Canada. And it would have been the case for 98 people who died at the Camsell had it not been for persistent families, committed individuals, and a woman keeping her husband’s papers safe for twenty years.